Think you know the Taylor sound? Think again. Powered by V-Class bracing, our versatile round-shoulder dreadnought brings an inspiring new sonic personality to the dreadnought category and the Taylor line. Our Grand Pacific makes quite an entrance in the form of these mahogany and rosewood Builder’s Edition siblings. With feel-good features like our new compound-carve neck profile and Curve Wing bridge, it’s hard to know which will be happier — your ears or your hands. Andy Powers has tailored our new bracing architecture for our most compact body style, unleashing a more powerful, flavorful sound. An overview of our five body styles, including tips on how to choose the one that fits you both physically and musically. Learn more about the sonic personality traits of the tonewoods we use and how they help flavor a guitar’s sound. An overview of our guitar framework, including the woods featured within each series, plus a guide to our model numbers. Get to know our guitar lineup and see how the tasteful blend of tonewoods and aesthetic details gives each series an identity all its own. Kurt reflects on everyone who contributed to a successful year, and in true Taylor fashion, looks ahead. Bob checks in from Cameroon, shares why the Grand Pacific makes him feel like a proud grandpa, and explains how urban forestry could impact the guitars of the future. Drawing inspiration from Walt Whitman, Andy reflects on how our latest guitars, like songs, can reveal that old and new aren’t as far apart as they might seem. Mexican-made guitars, pickguard preferences, red spruce from Italy, ebony coloration, and more. Scott Paul shares an update on our work with The Ebony Project in Cameroon, koa reforestation in Hawaii, and the protected status of rosewood. Wood&Steel began as a desire of Taylor co-founders Bob Taylor and Kurt Listug to create an informative communication channel between the company and the people who buy our guitars. Since its summer 1994 debut, our quarterly “owners newsletter” has evolved from its grassroots beginnings into a robust publication that covers all things Taylor, taking readers inside the Taylor factory for the inside scoop on our latest guitar developments and out into the world to connect with Taylor players, dealers and others who make up the vibrant, extended Taylor community. From stories about sourcing wood to guitar care tips to Q&A’s with Bob, we strive to share our passion for making and playing great guitars and to chronicle yours. 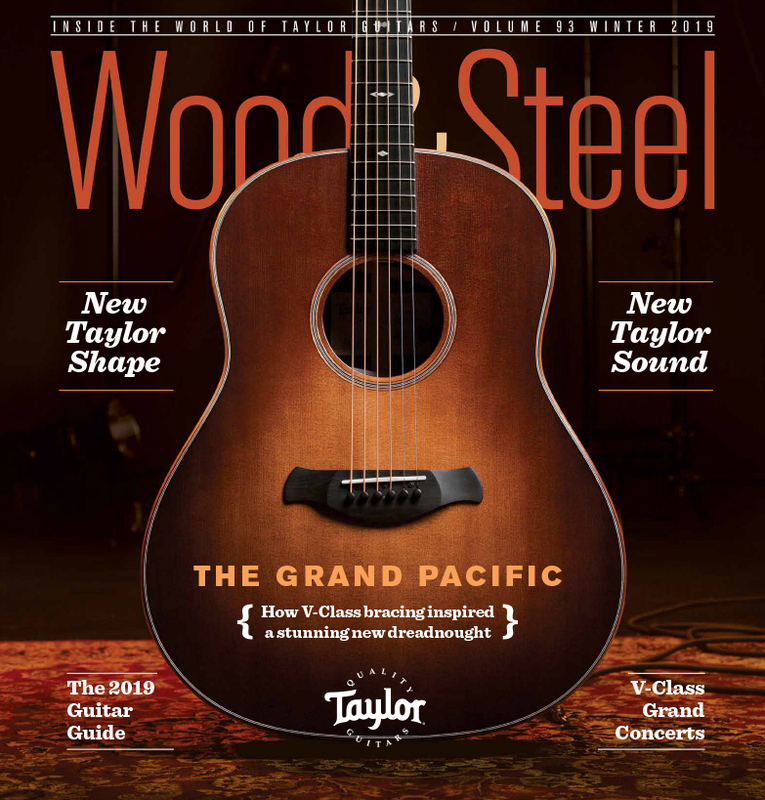 Wood&Steel is direct-mailed (free of charge) only to Taylor owners in the U.S. and Canada (if you are a Taylor owner in either country and are not receiving Wood&Steel, see our Owner Registration page). Free copies also are available at authorized Taylor dealers around the world, and each issue is viewable online. There is no paid subscription service.